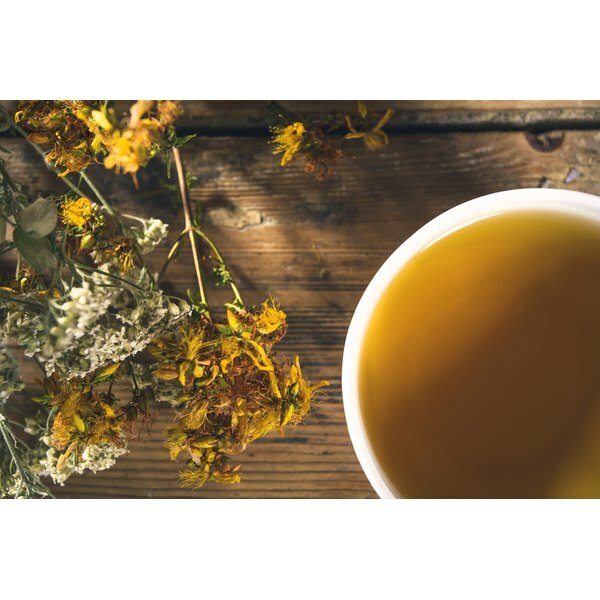 Hypericum perforatum, commonly known as St. John's Wort, is an herbal remedy people primarily use for treating anxiety, depression and insomnia. Many side effects are possible, such as dizziness, dry mouth, fatigue, headache, increased sensitivity to sunlight, upset stomach and sexual dysfunction. Using St. John's Wort also can affect the heart, although this is not common. Side effects involving the cardiovascular system during normal use of St. John's Wort are uncommon. Anyone experiencing these side effects should seek immediate medical attention. They include rapid heartbeat (tachycardia), a forcefully-beating heart or heart pounding (palpitations) and high blood pressure (hypertension), as listed by eMedTV. St. John's Wort can elevate liver enzyme activity, which can reduce blood levels of other medications as the liver filters the blood. This can make medications less effective. Additionally, St. John's Wort may reduce absorption of some medications from the digestive tract, further lowering their effectiveness. This can be dangerous when it involves drugs such as heart medication. The National Center for Complementary and Alternative Medicine (NCCAM) specifically lists digoxin as a medication that can be affected by St. John's Wort. Digoxin strengthens heart muscle contractions, and doctors prescribe it for congestive heart failure and abnormal heart rhythm (arrhythmia). Taking St. John's Wort with certain other medications, such as antidepressants or drugs to treat migraine headaches, can increase the risk of a dangerous condition called serotonin syndrome. This might also happen with an overdose of St. John's Wort. Serotonin syndrome can cause tachycardia along with many other symptoms, including elevated blood pressure, muscle rigidity, fever and confusion. It can lead to coma and death. Can I Take Benicar & Eat Grapefruit?